As soon as I was offered this book to read, I knew that I wanted to do so! It ticks so many boxes for me! I enjoy Gold Rush stories, I love the whole dual timeline story concept (and have read quite a few over the last month or so) and the synopsis sounded interesting so there was a lot to anticipate liking. In 1872, seventeen-year-old Amy Duncan arrives in the Gold Rush town of Millbrooke, having spent the coach journey daydreaming about glittering pavilions and gilded steeples. What she finds is a dusty main street lined with ramshackle buildings. In present-day Millbrooke, recently widowed artist Angie Wallace has rented the Old Manse where Amy once lived. When her landlord produces an antique trunk containing Amy's intriguingly diverse keepsakes - both Oriental and European - Angie resolves to learn more about this mysterious girl from the past. And it's not long before the lives of two very different women, born a century apart, become connected in the most poignant and timeless ways. The book opens with young Amy Duncan travelling from the thriving city of Sydney to the Gold Rush town of Millbrooke. She has been summoned there by her very strict, very narrow-minded father who is the town clergyman. For Amy, this means an end to a life with her aunt who lets her read scandalous novels (one of my favourite aspects of the book), buy pretty dresses and attend charming entertainments. In her new life, she will be expected to work hard by her mother's side looking after her siblings, acting as a type of governess to another young girl in the town and to behave properly at all times. Life starts as expected but Amy is given a glimpse into a more exotic life when she visits Mr Chen's Emporium. 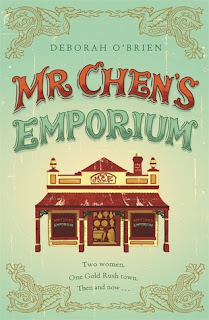 He gives her some tea but like so much of her life, spirited Amy must hide this gift from her father who has a very poor opinion of men like Charles Chen. This is because Charles and his brother are of Chinese origin. Charles is a little different to some of the other Chinese in town because he was in effect adopted by one of the most influential families in town and so he has the benefit of a good English education as well as his Chinese ethnicity. Amy is at once intrigued by Charles, and when his adoptive family facilitate a meeting between the two it becomes clear that those feelings are well on their way to being reciprocated. But it is the 1870's and whilst interracial relationships would have occurred, they would have been very unusual and would most likely have resulted in a young woman like Amy being shunned by her local community. Even with just this factor, life would have been difficult enough, but this is the goldfields where the antagonism between white miners and their Chinese counterparts is simmering just below boiling point at the best of times. Those tensions rise again in Millbrooke, potentially putting those more moderate people at risk of violence from those who want to see the Chinese forced off the diggings forever. In the modern day, recent widow Angie Wallace comes to the town of Millbrooke for the weekend and ends up staying. She rents the crumbling Manse from grumpy Richard Scott for a pitiful amount on the proviso that she will start doing some much needed renovations. For Angie, this is the chance for a new beginning away from the everyday memories of her life with her recently deceased husband. Her grown children do not understand her need to do this, and her friends are sceptical too. Angie, however, sees this as a chance to recharge her artistic batteries, and she soon finds herself drawn into the life of the town when she starts teaching art to a group of ladies who live in the town. Millbrooke is a town that is still under the influence of gold mining and is again potentially going through a new transition period. This time though, it is a big international mining company that has it's sights set on the town. They are promising jobs and good times for the whole town, as long as they can get the necessary approvals that they need to start the process. The face of the mining company in town is American Jack Parker. It isn't long before the smooth talking Jack has taken up residence in the Manse as a boarder. What links the two stories is a small trunk that Angie finds that contains small artefacts that have her searching the past for evidence of Charles and Amy Chen. While she searches the historical records related to Millbrooke, she finds herself drawn more fully into modern Millbrooke. I especially loved the idea of the art exhibition that she does with her painting class which focussed on the people and past of the town. The author is a visual artist as well as an author and you could really feel her passion for this side of her work shining through the pages in that section. In terms of the characters, I was much more invested in the historical characters. I would have loved to have seen more about Amy and Charles and their relationship, but I did enjoy the glimpses that we did get to see, especially in later life. I am not sure that modern sensibilities didn't colour the relationship more than would have been possible in reality, but I suspect getting the balance right between those two differing perspectives would be quite difficult. I also really enjoyed Amy's relationship with Charles' adopted sister Eliza, who has very grand and ambitious plans for her life and I suspect that there could be an interesting story to be told about Eliza in future if the author wished to go down that track. I was less enamoured of the modern characters. I liked the way that Angie's friendships were portrayed, and I loved seeing a 50 something heroine who brings all her experience to the novel. I really enjoyed seeing her search for the clues that she could find about Charles and Amy and the town itself. Where I really struggled was with the choices that she made and in the representation of the two main male characters - Jack and Richard. Richard in particular was a bit of a mystery. Initially he was portrayed as something of a drunkard but later as something completely different. The dual storyline accent was very structured - much more than you would necessarily see in other similar books. For example, this week I read another book where the first third of the book concentrated on the past, and then moved forward in time with a look back over the shoulder at the past. In this book, in the beginning of each chapter we heard about Amy and her story and then we moved forward in time to see what was happening in Angie's life. I did wonder if the intention was to try and draw direct parallels between the two stories. If so, it didn't quite work for me especially in relation to correlations between Amy's relationship with Charles and Angie's relationship (not going to tell you who with, but I will say I was disappointed with this particular aspect of the story). Whilst this book didn't work for me in all aspects, I was interested in the story that debut author, Deborah O'Brien, has brought to the page. In the notes, she mentions that she is writing a sequel and in the Q and A that I hosted on my blog, she says this is a modern setting only which I am not sure about but still.